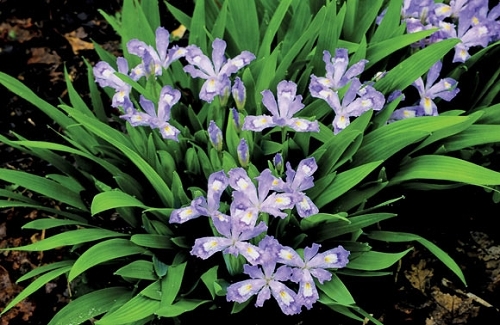 Dwarf Crested Iris is a small plant that colonizes and makes a nice ground cover or border for shady areas. "Stemless" flowers float above the short foliage. Performs best in half sun/half shade and well-drained soil. Dwarf crested irises that receive a lot of sunlight will probably need to be watered regularly. It spreads via rhizome and can be divided as needed. Try this small iris in container gardens. the blooms on this plant are beautiful!! The plant does expand slowly which allows you to divide. Excellent for a rock garden or front of the border. I have mine planted in sun/shade, late afternoon sun. Very nice plant, hardy, and blooms are pretty!